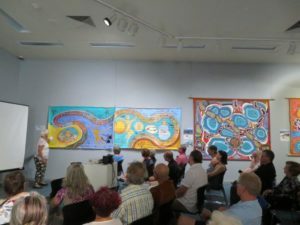 On Monday 21 January, Green Skills, in conjunction with the Shire of Katanning’s Art Gallery held a Gondwana Connections art exhibition opening and eco restoration event at which 34 people attended.This event forms part of the South Coast Festival of Birds & Biodiversity. 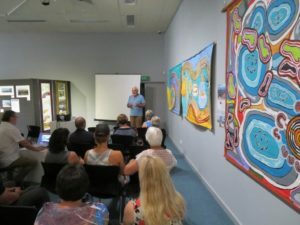 This exhibition opening included a Welcome to Country by a Katanning Noongar Elder, Gabrielle Hansen as well as presentations by Aunty Carol Pettersen, and Basil Schur of Green Skills. Gallery manager James Wood was MC for the event. A short film featuring Balijup and its eco-restoration and art programs was shown. 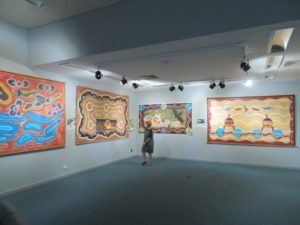 The principal artists represented in the exhibition include Joey Williams, Audrey and Errol Eades,The Women’s Group facilitated by Carol Pettersen, Lynne and Ken Tinley, Nikki Green, Janine McCrum, Robyn Lees, Helmie van Melle, Christine Harrison, Rosemary Turle, Jacqui Gale and Karlee Bertola. Nikki Green and Janine McCrum set up the exhibition. 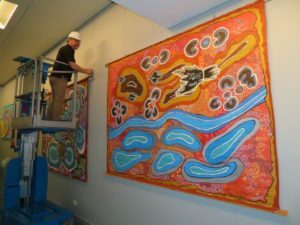 Key support has come from Poornarti Aboriginal Tours, Eugene Eades and the Eades family, Friends of Nowanup, the City of Albany’s Vancouver Art Centre, and Community Arts Network WA, the Denmark CRC. This project has been supported by funding from the Western Australian Government’s State Natural Resource Management Program, supported by Royalties for Regions. In addition this event has been supported by the Shire of Katanning, Lotterywest, The Koorabup Trust, and Gondwana Link. This event also forms part of the 2019 South Coast Festival of Birds and Biodiversity. Thjis Festival is supported by Lotterywest, BirdLife Australia, Green Skills, UWA Albany and many other groups and individuals.